Ultimately it's down to the contractor which method he will choose but for now I'm aiming to model the former. 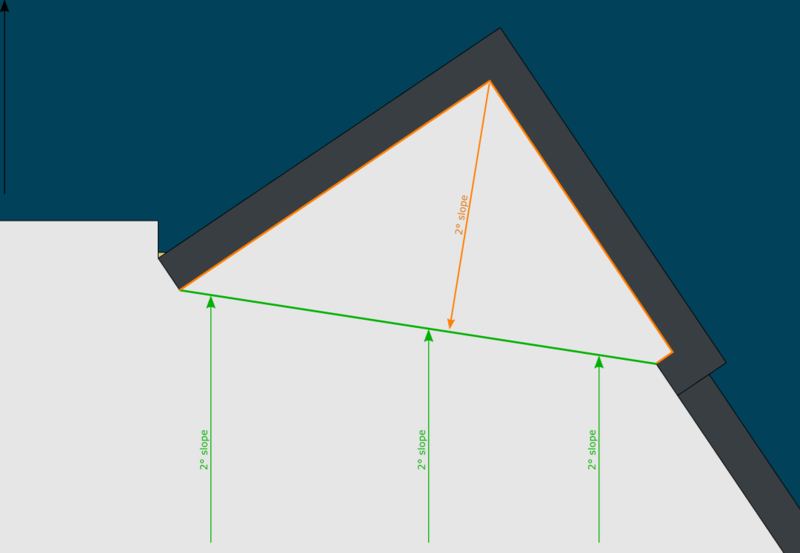 I need to create a roof which has a 2° fall which matches the main roof (to the underside) and another 2° slope which falls in a completely different direction. I don't think this can be achieved with a system roof via shape-editing so my next thought was to create a mass however I've never had to use masses before and I don't know if its possible to model the type of mass I need and if I can constrain it to specific slopes and directions. Any tips for the forum massing guru's would be appreciated. Alternatively, if there is a non-massing approach, I'm listening. Last edited by BLothian; May 22nd, 2018 at 10:17 AM. A separate roof that is adjusted using modify sub-elements will work. Don't forget that you can use formulas in the temporary dimensions. Hi Chad, many thanks for the sample. It does seem to work but I'm not fully clear on some of what you've done. On your roof cricket, you seem to have used pick walls for some of the roof sketch lines. I never use pick walls; I always use pick lines or draw the edge. 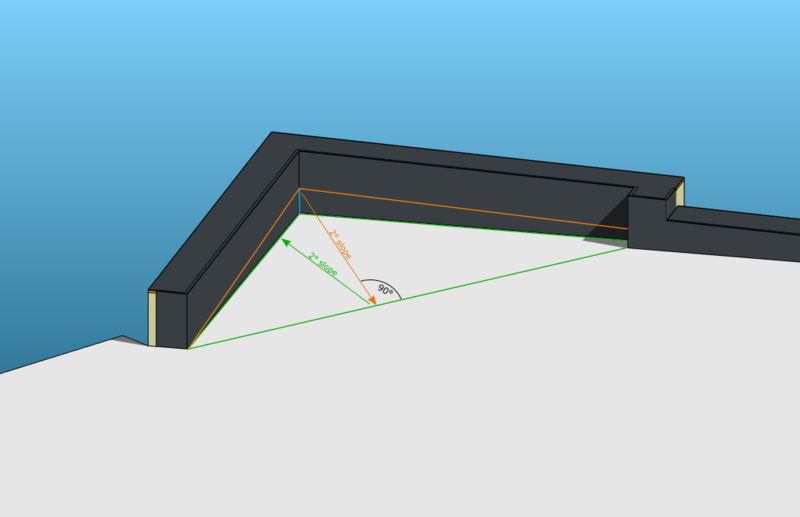 Is pick walls fundamental to this roof creation in order for it to work? I can't see how the slope to the underside of the cricket is applied to create the fall. There are no sketch lines with 'defines slope' applied . Am I missing something obvious? I can see that you have used shape editing for the top surface however it does not have a constant slope which is what I'm trying to achieve. If there was only 1 vertice above the main roof it would be fine but because there are 2, I don't think shape-editing will give the constant slope aside from trial and error but hopefully I'm wrong on that. Pick walls is habit, pick lines will work fine. The cricket is created as a flat roof, then moved so it is partially above the main roof and joined. Then move it down so the high point snaps to the main roof. You can then modify sub-elements and it will snap to the main roof where the two intersect. To get a single slope you will need a split-line (as far as I know) just because of the shape. Ahh so that's why I couldn't see it! I wonder if a slight drawback to this method is if using a compound roof buildup. My only slight concern would be the waterproof membrane finish being visible in a section view sandwiched between the insulation layers. 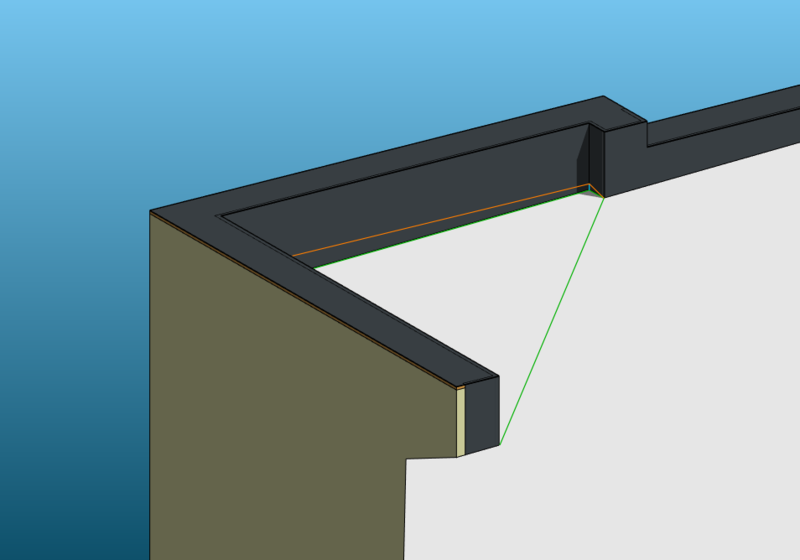 I'm not sure if layer function in the roof material would allow that to clean up or if it would need to be done as separate roofs (I don't have Revit opened right now but I'll check later). I make a new roof with the foam adjustable. The mid highest point is typically modified to be 4" higher and the rest is adjusted to match the existing roof. As long as the slope works out, the exact numbers are (mostly) irrelevant. In the field they may build up a foam cricket, bodge something together out of scraps or purchase a pre-manufactured cricket. I gave up trying to get them to use what I called out years ago. At that point, it's out of my hands. So model it to match what you already have and hope for the best. Membrane roof on Tapered Insulation. Set minumum thickness per code at roof drains ( if any). showing exactly how each layer will be cut/pieced together for final insulation installation. Once joined you shouldn't see anything but the insulation. If you do, change the join order. To get a single slope you will need a split-line (as far as I know) just because of the shape. Meant to say, there is no reason why you shouldn't be able to achieve this without the split as the 2 highest vertices can exist on the same plane in 3D space as the 2 lowest (which intersects with the main roof). Its just determining the correct Z-value of the of the 2nd highest vertex is otherwise you (should) get an interior edge. Shaped Edited Tapered Insulation Roof Types, with Join Geometry, and some of the roofs modeled with larger extents than the final, so they can be carved out with Vertical openings, to guarantee the Slopes are spot on, and no approximated with Shape Editing (for the main roofs underneath). Oh, the fun things you can do with Shape Editing, and Join Geometry.